Premiership clubs could be in breach of contract if they implement a Heineken Cup breakaway plan, says former Rugby Football Union chief Martyn Thomas. 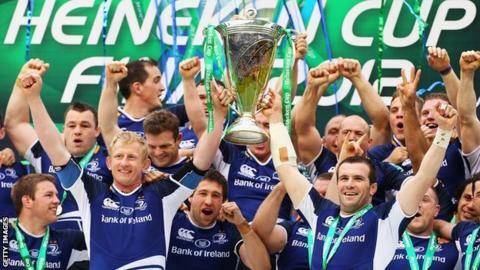 to show live European matches from 2014, raising doubts over the future of the Heineken Cup. Thomas says an agreement between the RFU and clubs prevents this happening. "It stipulates the clubs must play in the two European competitions up to and including 2015-16," he told BBC Sport. "If they go ahead with this breakaway they could be liable for a legal challenge and having to pay substantial damages." Thomas, a former lawyer, was chairman of the RFU when the agreement was signed in November 2007, securing an estimated £110m for Premiership clubs. The agreement "governs the professional game in England" from 1 July 2008 until 30 June 2016. Stakeholders in European Rugby Cup (ERC), the organisation charged with governing the Heineken Cup and Amlin Challenge Cup, will meet in Dublin on Tuesday to discuss the future of European competition. A spokesman for Premier Rugby told BBC Sport he "did not recognise" the clause in the 2007 agreement that Thomas was referring to. "The clubs will still be competing in European competition anyway, although under a different guise, and the meeting in Dublin is about defining a new European competition," he added. The RFU refused to comment, referring back to the statement it released last week, which read: "Whilst the RFU has not given consent to Premiership Rugby to grant European broadcasting rights, we believe it is important to work with them and with all parties involved to find common ground." ERC responded to Premier Rugby's announcement last week by declaring their own new four-year deal with Sky. But Premier Rugby argues that ERC's right to negotiate broadcast deals on behalf of unions is only valid until the start of the 2014-15 season. On Saturday, Premiership Rugby chief executive Mark McCafferty had said: "The context everyone has to remember is that there is no European competition after 2014 for anyone, because notice has been served on the accord so there is a vacuum in 2014. "We are trying to decide - everyone is trying to decide - what should replace it. Whichever way, there will be new competitions after 2014." Meanwhile, Brett Gosper, the new chief executive of the International Rugby Board, is confident that the future of European club rugby will be resolved. "It's an issue between the RFU and the PRL and we're pretty certain they will sort that out," he told BBC Sport. "The good news for rugby is there are some powerful media interests that are interested in the sport of rugby and that's a good thing to take out of it. "We're hoping and we're sure that the RFU and PRL will sort out the issues that will put this back on track."